With this model, ZAPI brings our 15 years of industry leading experience with asynchronous control technology and provides a flexible and robust product. This model is designed to drive one synchronous or asynchronous motor rated up to 1.5Kw plus an additional DC brushed motor. Depending on the application, this model can process the majority of the vehicle control through the configurable onboard I/O. The field-upgradable firmware can be fully customized to the OEM's specifications, or a CANopen solution can be supplied to provide superior flexibility. 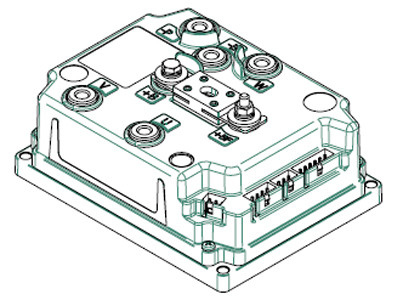 Multi-motor algorithms such as dual-drive and quad-drive are available, by linking the controllers via CANBUS, thus creating an adaptable electronic differential. The CombiBLE-X/BLE-X is configured to run synchronous motor technologies such as PMAC, BLDC, and IPMAC. This model is compatible with Hall Effect or Sin/Cos encoder signals to determine motor RPM feedback. This ZAPI motor controller comes standard with CANBUS communication, Flash programming, and ZAPI's patented algorithm are compatible with ZAPI's standard PC based diagnostic tool.